More people work in call centers in the Philippines than in India. The growth rate of India’s call center industry has slowed as it faces demand and supply side pressures. Many clients are moving work back onshore, operating costs are increasing and the jobs are loosing their luster. India now faces stiff competition from the Philippines, according to recent research from IBM. The study for the Contact Center Association of the Philippines estimates that 350,000 Filipinos work in call centres, compared with 330,000 Indians. 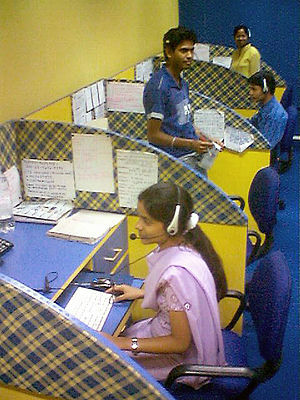 via BBC News – India’s call centre growth stalls. Signs of slowdown in Indian IT sector? Indian IT companies are delaying joining dates of new hires. This may reflect an expected slowdown in demand for IT services in mature markets. It may also have something to do with the double digit salary growth witnessed in this sector, which is reflected in lesser attrition – attrition is down from 25% to 15%. This year, TCS has campus hired 40,000 students, Infosys 30,000, Cognizant 28,000, Wipro 20,000 and HCL 8,000.
via Slowdown: IT cos delay freshers’ joining letters – The Times of India. However, this is not dampening the current hiring spree, which reflects an expected uptick in demand for IT services within the next 1.5 – 2 years. IT companies are hiring heavily at engineering campuses across India, with many students receiving multiple offers. Take the case of Amrita University which has campuses in Bangalore, Coimbatore and Kochi. India’s second largest IT exporter Infosys and Nasdaq-listed Cognizant shared the first slot. While Cognizant picked up 1,263 students, Infosys went for 1,255. Around 970 students had common offers and finally, 83% of them opted for Cognizant while the remaining chose to go with Infosys. However, this does not tell the full story. Students who receive an offer today will likely join jobs after another year. After joining the job, most fresh engineers receive 3-6 months of training before they join projects. Thus the hiring of today reflects the projected demand for IT services, 1.5 -2 years into the future. During 2011, over 4.3 lakh fresh engineering graduates are expected to pass out with 2.5 lakh will be graduates with an IT degree, says industry lobby Nasscom. However, not all of them are directly employable and hence the huge scramble for talent at top colleges. Companies know this and are making a beeline for the top-level talent. via Recession? IT cos hire in large numbers – The Times of India.